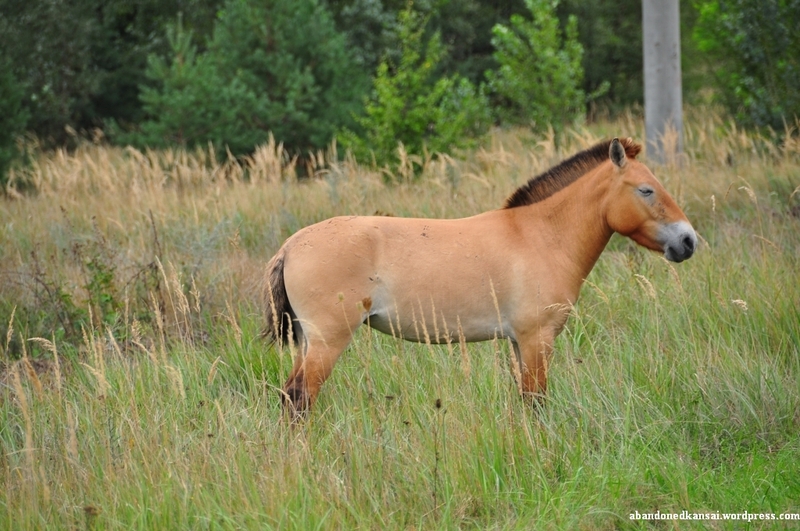 The Przewalski’s Horse (Equus ferus przewalskii, Dzungarian Horse), named after the Russian explorer and geographer Nicolai Przewalski, is a rare and endanger kind of wild horse and was first described in 1881 by L.S. Poliakov. 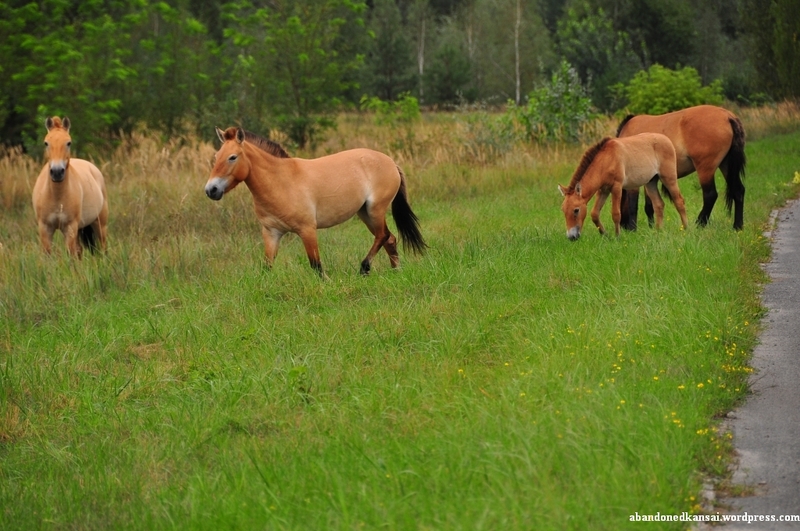 The current world population of about 1500 animals are all descendants from nine horses kept in captivity in 1945 (total population then: 31). 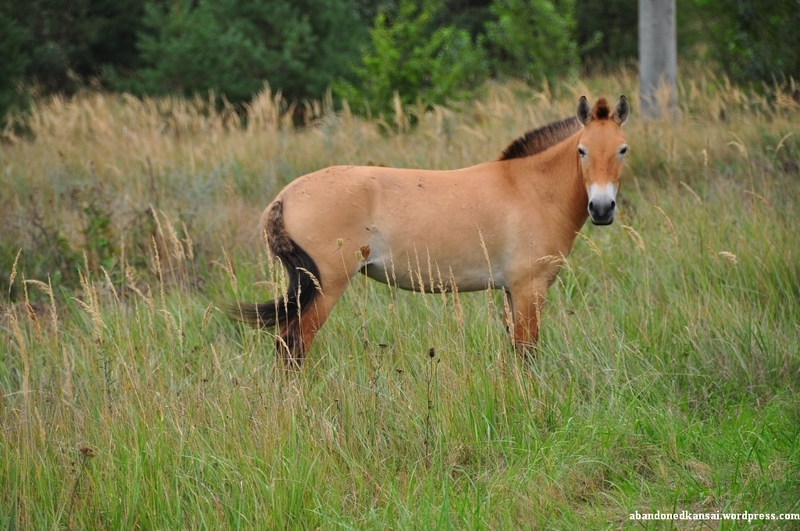 At one point extinct in the wild Przewalski’s Horses have been reintroduced to their former native habitat in Mongolia as well as to Hungary, China and Ukraine; the latter one offering space for the wild horses in Askania-Nova and the Zone Of Alienation. On the second day, when we were driving from the monument at reactor #4 of the Chernobyl Nuclear Power Plant to do some more exploration in Pripyat, Maxim and our driver all of a sudden had a quick conversation in Ukrainian. Close to a building in the middle of nowhere they stopped the car, got out and pointed to the road in front of us. 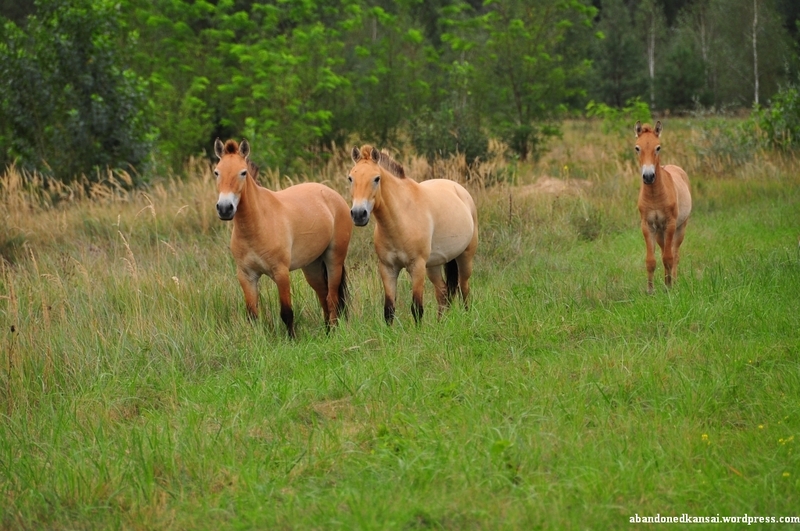 Przewalski’s Horses. At first I had no clue what they were talking about, but then a horse’s head appeared behind a tree about 80 meters in front of us. 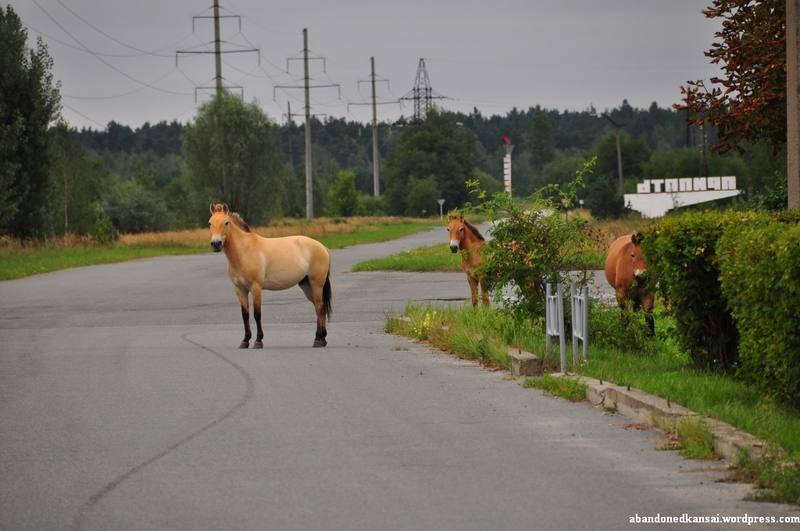 The horse was carefully stepping on the street, followed by about half a dozen more. Maxim and the driver (sorry dude, forgot your name!) were really excited, taking pictures with their cell phone cameras. Luckily I had my 18-200mm lens mounted, so I was able to take some quite nice shots of those shy creatures. 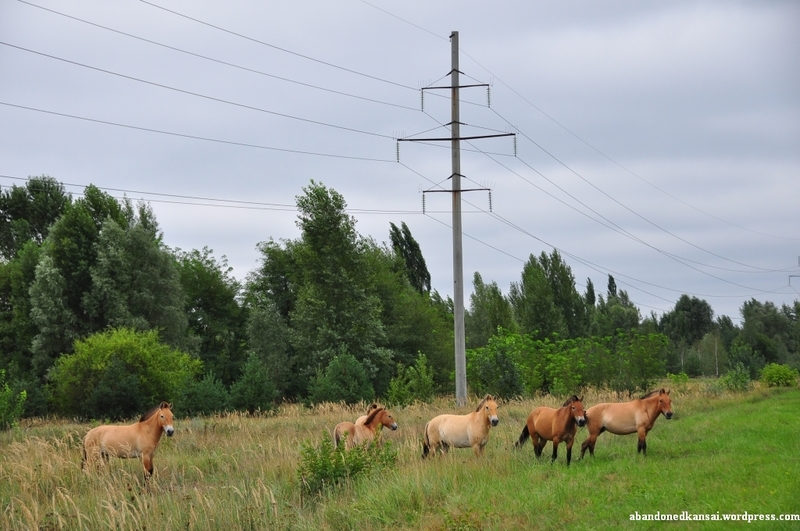 I’ve never seen wild horses before and it was very interesting to see how they behaved – they kept us under constant surveillance. While some of the horses nibbled on some grass now and then, at least half of them always had their eyes on us, making sure that we didn’t get too close. 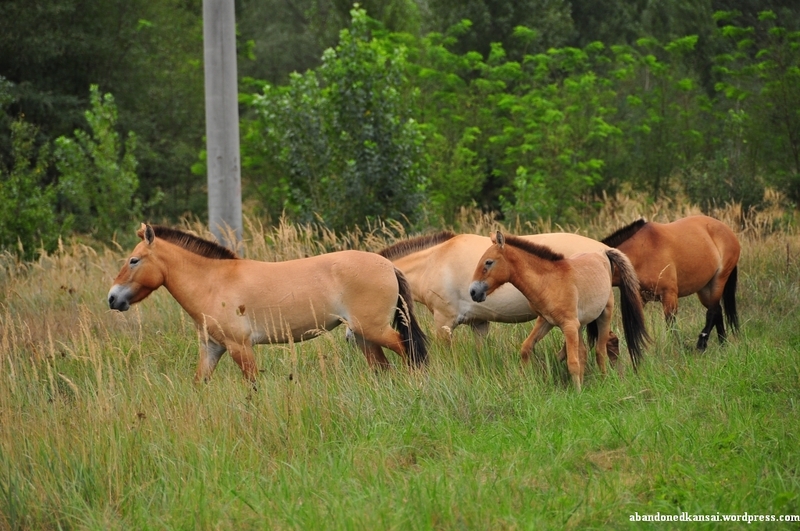 Having urban exploration as a hobby I ran into all kinds of rather unusual wild animals before – snakes, boars, monkeys… but the Przewalski’s Horses were by far the most impressive ones. Another experience that took me completely by surprise. Beautiful animals! Sounds like you were super lucky to see them. I’ve never seen a wild horse, so this would take me by surprise as well. Yeah, the whole thing was a big surprise since I didn’t even know those horses existed. 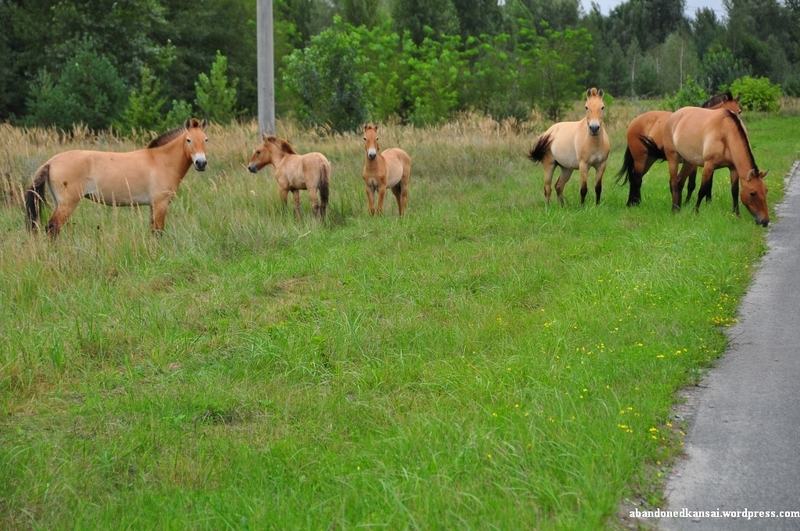 At first I though Maxim exaggerated a little bit since he told us the story on the first day and then we actually saw them on the second day – but given that I haven’t seen the horses on any other HP about the Zone Of Alienation I guess it was indeed a rare encounter. Beautiful creatures! I’m surprised that the extra radiation isn’t hurting them too much. They seem to be doing fairly well (other than bored militia). I remember the earlier scientific work to help preserve these horses. It would be good if a conservation project was possible in order to save this important species – and maybe relocate them to somewhere safer. I am sure there is more than enough space on this planet for a project like that, but nobody who is willing to spend the money. Seeing these horses was one of the highlights of that trip!